This WIDGET will put a Screensaver's dock on the right side of your screen. Just requires that DesktopX is installed on your computer. BTW, if you have Norton AV 2003, ignore its script warning, it will give a VB script warning to anything that runs scripts. actually looks alot like chadamus' sidebar on his indemnity theme. Looks great, nice job. Strange..it's telling me I need DesktopX installed...yet I have the most current version of ALL ODNT products.. This is a widget, which means it will run, Evan if DX in not running. This is a new feature in DX 2.2, It allows for some really cool stuff if you think about it. 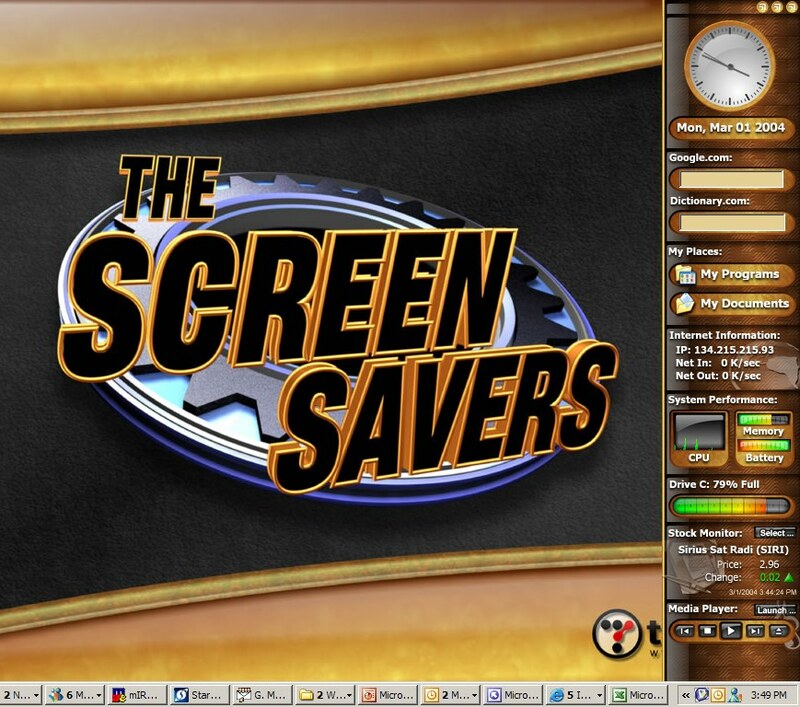 For example, I you have the freeware version of DX installed, but not running, you can run any widget. Also, you can make a object, that you really like, and only want to run that, then you can make it a widget of it. Turn of DX and just run the widget instead, which allows for one less application running. And the widget only uses as much memory as is needed for that one widget. Also, it allows you to distribute a widget to people who are not interested in doing there own customization. All they need is DX installed, Evan the free version. Check out the new DX Documents to learn all about it. Super dock! As for the not ebing a valid desktopX package, make sure the folder has been extracted. You have to extract the zip files before it can open it up. I had the same problem. I hope that helps. Is there anyway to modify the format of the widget? How about support for Mozilla Firefox? Goggle bar cuts of text ( won't allow more then 17 char's) . Last thing how about support for IM ? OK.Maybe it's just me but I think this whole widget situation is a giant leap for DX and a small step backwards for DX users. I can understand the whole concept but I don't like the idea of not being able to tamper with the objects(change size,fonts,transparency etc. )I'm currently using the Longhorn Dock (which is inferior to this one)and when I set the transparency to 40% opaque the wallpaper shines through it and it's a sight for sore eyes.I can use the dock without missing 1/5 of the desktop.Maybe a good idea would be to upload these widgets as simple DXobjects as well.Otherwise a beautiful object created by true artists. is there a way to have the dock and not have the wallpaper, i like my own wallpaper, and i thought the dock would blend well with it.